Oranges are at their best at this time of the year, especially the Seville oranges with their bitter flavour. They can be used in this recipe to give an extra boost of flavour, but the usual ones are good too. The glazed slices on the top not only make it look inviting but taste special. The yogurt makes a very light cake. You will need a 20cm /8in round cake tin or a spring form tin. Line the tin with greaseproof paper and grease it. Heat the oven to Gas 4 /180C / 350F. Whisk together the yogurt, sugar, eggs, orange zest and cooled butter. Fold in the flour. Put into the tin and bake for approximately 1 hour or until golden and firm to the touch. Leave in the tin for a few minutes then turn out onto a cooling rack. When it is cold, slice it in half horizontally. 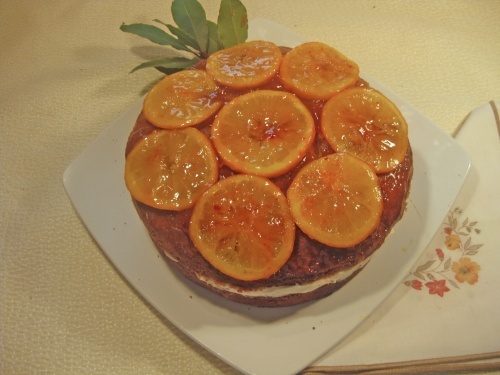 Filling: Beat the mascarpone with the orange zest, juice and icing sugar. Sandwich the cakes together. Topping: In a wide pan over a low heat dissolve the sugar in the water. Cut the oranges into thin slices (you will need about 8). Place them in the pan and simmer until the peel softens - about 15 - 20 minutes. Carefully remove them from the syrup and arrange them on the cake. Glaze: Melt the jam with a tablespoon of the syrup and whilst hot brush over the top of the cake. Note: If you prefer for the filling, instead of mascarpone you can make butter icing with 110g (4oz) icing sugar and 50g (2oz) butter or margarine and the orange zest.